Sammy and Ray, leatherback turtles and friends forever, are enjoying an atoll’s water and sand, shepherding new hatchlings Ricky and Ella out to sea. Suddenly, a poacher swoops in and ships them off to be part of a spectacular aquarium show for tourists in Dubai. The kingpin of the place, Big D the seahorse, enlists them in his plans for a great escape. 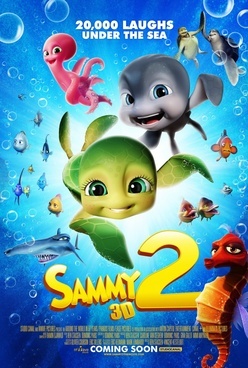 But with their new friends Jimbo the bug-eyed blob fish and Lulu the snippy lobster, Annabel the sweet Octopus, and a whole family of penguins, Sammy and Ray hatch breakout plans of their own.